“The Breaking” is Book 2 in The End Time Saga by Daniel Greene. An epic, fast-paced adventure, featuring a diverse cast of characters, non-stop action, and of course, zombies – this apocalyptic thriller is a sure victory for the genre. The dead, known as the infected, have been devastating the planet for months, and with all attempts to stop them falling short, hope for the future of humanity appears bleak. On their mission of delivering CDC doctor, Joseph Jackowski to government officials, former counterterrorism agent Mark Steele and his troop are ambushed by a gang of ruthless mountain men, who have their own agenda during the apocalypse. Not knowing who is alive or dead, Steele knows he must find his people at any cost. Dr. Jackowski is the only person in the world qualified to develop a cure for the virus infecting the world, but he must find Patient Zero first. His efforts are stalled when he is forcefully enlisted into a failing military force. Retired Air Force Colonel Michael Kinnick is tasked with finding Dr. Jackowski. With his own unit at their breaking point, will Colonel Kinnick and his men muster up the strength needed to find the one person crucial to the survival of the human race? 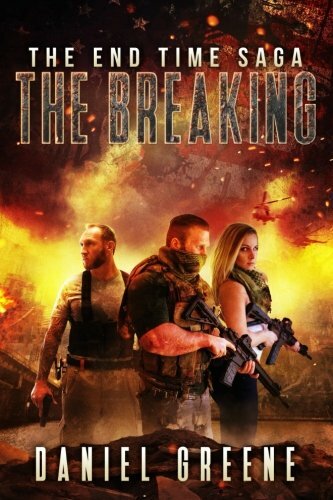 “The Breaking” is one of the finest military/sci-fi/zombie/apocalyptic thrillers I have read in quite some time. There is so much going on in this story, with furious action and suspense until the very last page. It successfully avoids the redundancy of zombies-devouring-the-human-race scene after scene, by incorporating creative and equally devastating sub-stories, with characters that should be feared more than the infected. Indeed, the West Virginian mountain folk are especially treacherous and disturbing, and the masterful writing and development of these characters generate far more fear and horror than the prospect of being eaten alive. Truly intense. Told from the perspective of each of the five major players in the saga, Greene invites us directly into his character’s heads to live through the action first hand. It is this multiple viewpoint approach that provides a clear path when delivering a complex story and I appreciate being able to feel the experience of each character. Gripping and chilling with an intensity that never ends, “The Breaking” by Daniel Greene is a must-read book for all fans of the genre.